It takes much willpower to resist the temptation of the asparas; beautiful dancing women in the court of Indra, king of the gods, in the celestial palace in Hindu mythology. They are the heavenly charmers who fascinated heroes and allured sages from their devotions. They tempt with “rewards” in heaven given to heroes who fall in battle. 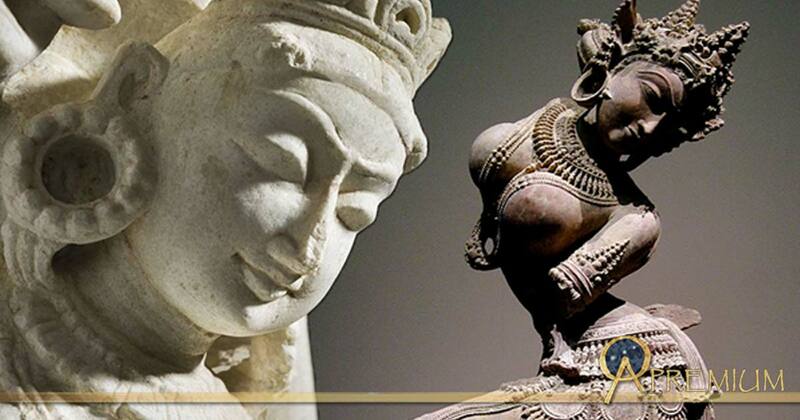 The apsaras have the power to change their forms and give good luck to whom they favor. When visiting the religious complex of Angkor Wat, Cambodia, one will inevitably notice these dancing women depicted on the temple walls and reliefs. These same dancers were also an important motif in the art of Champa (c. 192–1832 CE), medieval Angkor's neighbor to the east along the coast of what is now central Vietnam. Also noteworthy are the depictions of these same women in the Tra Kieu Style of Cham art, a style which flourished in the 10th and 11th centuries CE. 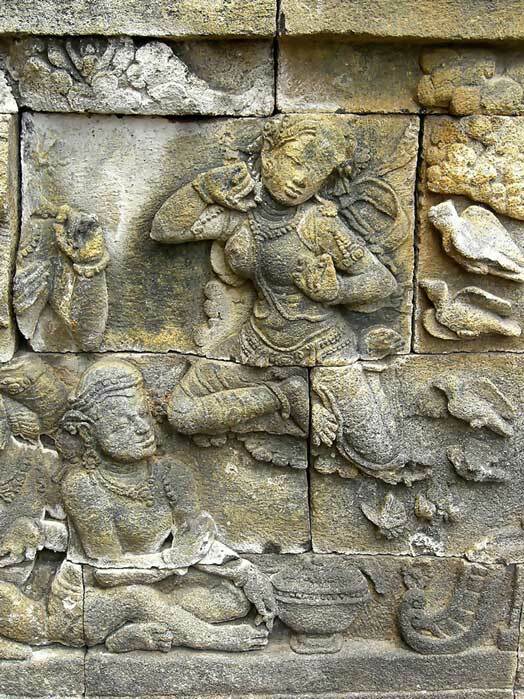 Images of the apsaras are also found as decorative motifs and integral parts of the stories in several temples of ancient Java dating from the era of the Sailendra dynasty (c. eighth century) to that of the Majapahit empire (c. 1293 - c. 1500 CE). The most famous of these images of the apsaras can be found on the Borobudur temple, where they are depicted as divinely beautiful celestial maidens, pictured either in standing or in flying positions, usually holding lotus blossoms, spreading flower petals, or waving celestial robes as if they were wings. The Vayu Purana enumerates fourteen apsaras, while the Harivamsa says there are only seven. In the epics and the Puranas, the apsaras are artists who perform at the court of Indra, as well as at other happy occasions such as births and weddings of the gods, and humans who are particularly favored by the gods. Additionally, they are courtesans to the gods; they are frequently employed by Indra to distract kings and sages who Indra fears to be progressing well along the path of divinity and therefore capable of depriving him of his throne. Although the apsaras are not prominently noticed in the Vedas as a class, some of them are mentioned by name - such as Urvashi and Tilottama. The apsaras are said to be the creations of the Seven Manus, the progenitors of mankind. However, more is said about them in the epic poems, as the Ramayana attributes their origin to the churning of the ocean. The Puranic account of their origin agrees with this by saying that neither gods nor asuras (demons) would wed the apsaras when they rose from the waters. Therefore, the apsaras became the common property of both gods and asuras which led to them sometimes being referred to as "the wives of the gods," and "daughters of pleasure." The apsaras are closely associated with the gandharvas, the celestial musicians, which leads to frequent pairings between them. However, the relationship between the celestial performers is temporary and not considered a marriage tie as the apsaras, in addition to entertaining at Indra's court, are often sent to disrupt the penance of sages. Sometimes, an apsara would succeed in seducing the sage and achieve her mission. However, at other times, she would incur the wrath of the sage who would curse her. 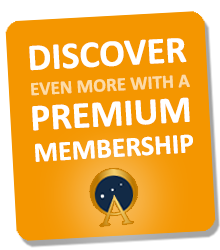 Martini Fisher is a Mythographer and author of many books, including “ Time Maps: History, Prehistory and Biological Evolution ” - What if all you've been told about history was wrong?